I took a mini New Haven ish trip yesterday. Wanted to hit three places, got to two. I wanted to hit ZUPPARDI'S, COLONY GRILL AND ROSELAND APPIZA. Couldn't make it to Roseland. I really wanted to see if it was as good as people say....as well as IF they really charged as much as I read about....but someother time I guess. If you read up on Slice, ZUPPARDI'S is a NON wooster street pizzeria, one that DOESN'T have a coal oven, put has been listed as the best place in CT several times. I've been to Pepe's, Sally's, and Modern....with modern my fav, but NONE of the three are places I am in love with. Zuppardi's uses 4 ft Bakers Bride gas ovens. I've only worked with 6 footers, so I guess they are 120,000 BTU units also. Zuppardi's is best known for two pies...the fresh, shucked TO ORDER, clam pie....and their sausage pie, with the sausage made in house. For being a place started in the 30's, it was cleaner and a tiny bit more modern than I thought it would be. The place was empty when we got there, a little past 2 inthe afternoon. Since the guy I was with didn't want clams, we got a largre sausage pizza. Before describing it and asking my usual questions, I gotta tell you....I WAS THE SINGLE BEST PIZZA I HAVE EVER EATEN. SIZE: 18". Not quite round, which is totally NH. CRUST. INCREDIBLE. Unbelieveable. Stupendous. For me. I know that others here would think that, but for me, heaven. It was GB (I know Scott hates this) BUT, with plenty of char, in spots....the way I like it. Not the whole rim, but some big bubbles were charred perfectly. They use semolina to coat their peel before placing on the skin. Im not a big semolina fan, but it worked. This crust, TASTED, SMELLED, AND LOOKED like old fashioned italian peasant bread...it even had the small cracks in parts of the crust, just like ciabatta or pugliese cracks as it cools!! The slice could be picked up and it stood straight, no drooping until at least half the pie was finished. It had incredible texture, flavor, crispy but then chewy....just like Italian bread. I tried to looks for empty flour bags, but I couldn't see any...my guess, a bread flour simply because, as scott and Chau have pointed out, as well as Lehmann, the crust was chewy as heck the next day. But, the crust was SO different, could I have POSSIBLY have eaten a warm fermentation, same day dough?? Id be SHOCKED, but is was so different.......flavor was there, so MAYBE a preferment....but then again..this place has been around for nearly a century....old ways of doing things, preferment seems out of place.....don't know. SAUCE. Im a big, huge sauce fan, and the sauce was tasty...just not alot of it, which was a dissappointment. CHEESE. Whole milk, low moisture dry mozz, shredded...and a heavy hand....which would normally turn me off, since I am not a mozz fan, and I prefer fresh mozz loaf. But this mooz was very, very tasty. Knowing NH places, it probably was Calabro, a local cheese maker, but it didn't taste like it. Again, it was very good mooz. SAUSAGE. Very, very good.....great actually. Made in house, I tasted pork, salt and fennel, just as it should be. But it was saltier than mine, and I realize that its a good thing. And the way they placed in on the pie is right down my ally. LARGE chunks.... not itty bitty pieces, because the pizza maker is afraid of it being raw. And it wasn't perfectly placed on each pie, it was scattered, some pieces getting more mooz than others....Its a rule, in the biz, that every slice should be the same...but I don't like that, in someway it make a pie look too mechanized, I guess. No fresh basil, no oregano....these I wished they put on, but in keeping with NH, they weren't present. A great pizza.....overall, probably the BEST non NY style pie I have ever eaten. Now, how do I start deciphering that dough?? COLONY GRILL. Well, the colony grill, to me, is the best example of HOW diverse pizza can be. Its an example of how one person can LOVE a pie that other people can simply shake their heads at. It was the ANTITHESIS of Zuppardi's. Paper thin crust, cheese that I can't even describe as cheese, perfect little balls of sausage, that tasted fine, just to small and too even. Colony grill is known as a HOT OIL PIZA. The thing was drenched in it, and I like oily pizza, so I didn't mind. And it WAS spicy. My guess is that they buy a hot pepper, called STINGERS. I believe that these come packed in oil, and they drain the oil to use on their pies. The dough seem actually fried in this oil. It only came in one size. And there was NO OVENSPRING, AT ALL, to speak of. It comes in one 12 size. I can see how some people like it...I didn't HATE IT, i can understand wolfing one down with a few beers. I would guess the dough ball for a 12 inch pie was around 8 oz. My whole thing is that THIS pie is consistantly rated top ten. TOP TEN....meaning that its a favorite pie for many, many people. And I think the diversity of opinions is more pronounced in pizza than other food group. So, any ideas of this beautiful dough would be appreciated. Im gonna make warm fermentation dough on Thurday. I'll put a poolish together on Wed. I'' make two small batches in the am, one with preferment, and another straight fresh yeast dough, finishing them a room temp Thursday morn and balling them, skin them and bake em Thursday night. Im not expecting anything great, but you never know. 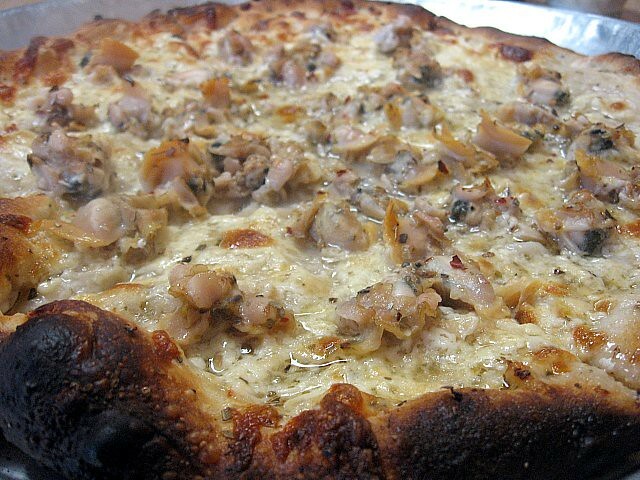 Next time I go to Zuppardi's, next week, Im gonna feast on the FRESH SCHUCKED clam pie, I can't wait. So if any of you are in the West haven area, read up about them on Slice and then head out....you will love it...and understand what I am raving about. Thanks again to any replies. Re: MINI NEW HAVEN TRIP. Nick, I hope you took some pictures. If a pizza connoisseur such as yourself says he just ate the best pie of his life, I naturally want a full description and pictures. Very nice write up, but if you have the pictures, I also want to see what the best looks like. Preferably a few shots of the crumb, overall pie, individual slices, cheese etc. Much information can be gained from pictures. Also bake times along with descriptions of the textures can really tell us a lot about why that might have been a favorite for you. Nick is this the slice article you read, and did your pie look like either of these? If so the crust looks like it has a lot of potential to me. Was your crust darker than what is in those photos from serious slice? When you are talking about taste or flavor, it can be quite subjective. I think a well made crust with a great texture can seem to be really flavorful despite being made with commercial yeast. Textures, to me can play a big role in the taste of a crust. Bread and crusts can have great flavor despite not using a natural leaven. It's true natural leavens can impart different levels of complexity to the flavor of the crust. I would venture to say, that most of our members who have spent a good deal of time baking with natural starters can probably pinpoint it's use in a commercial crust quite readily. Char also throws another variable into the flavor equation. So to me, a crust with decent char, and proper texture can have huge potential despite not leavened with starter. Nick about being chewy the next day, that doesn't necessarily tell you the type of flour. It's more an indicator of the degree of gluten development. It's pretty easy to get a crust to be chewy and tough after the cool down, even low protein flours. The more the gluten is developed, the quicker and tougher the crust will get, sometimes as soon as the pie cools down after 2-3m. I have made some incredibly tender crusts with HG flour that have stayed soft and tender 3-4 days later in the fridge. Having said all that, you are probably correct in their use of a BF or even a BF blend with some HG flour. I think youre right on with the no oil gig.....my thoughts also. Sugar, you think?? Why?? Oh, and I really appreciate you taking the time to post....I know i clutter this site with a ton of questions. Thank you again. No pics...THIS TIME. But, I gotta tell you that sausage pie is as good as a pic I took, in fact i was amazed when it came to the table on how similar it looked. NH pizzas aren't known for consistancy of shape and doneness. Chau...these guys are old school.....a preferment.....seems like a long shot. The crust wasn't sour....AT ALL......but flavorful if that makes sense. It was simply different than any other I've ever had. CRUST. INCREDIBLE. Unbelieveable. Stupendous. For me. I know that others here would'nt think that, but for me, heaven. It was GB (I know Scott hates this) BUT, with plenty of char, in spots....the way I like it. Not the whole rim, but some big bubbles were charred perfectly. They use semolina to coat their peel before placing on the skin. Im not a big semolina fan, but it worked. This crust, TASTED, SMELLED, AND LOOKED like old fashioned italian peasant bread...it even had the small cracks in parts of the crust, just like ciabatta or pugliese cracks as it cools!! The slice could be picked up and it stood straight, no drooping until at least half the pie was finished. It had incredible texture, flavor, crispy but then chewy....just like Italian bread. the prevailing theories were dough enhancers, freezing, longer than three day ferments and large quantities of oil. I've been consistently getting micro-blisters on my undercrusts, though, with none of the above, so, long story short, the prevailing theories leave a bit to be desired. I am at 3% oil, which is a little above the norm for NY style, so that might be what's contributing to it, but, after thinking about this for quite some time, I think heat is a major factor. and that, from what I've read, is a 3-4 minute bake. It was the photo of the fried pierogies that sent me along this track. Because of the convective heat of the bubbling oil, frying is an intense burst of heat. And frying is, for just about any dough/batter, blister city. I am in no way implying that heat is the answer that we're looking for, but I have a hunch that it's part of the puzzle. Nick, GB and rigidity don't always dictate long bake times. It's not easy, but with a combination of a lower hydration, sugar and/or oil, GB/rigidity can be achieved while not sacrificing too much oven spring. Long baked pizza (7+ minutes) besides having a lack of oven spring, has kind of a dead quality to it. It just doesn't have that much character. And this pie has character. Maybe it's not a 4 minute bake, but I wouldn't go that much above 5. Above 5 and crusts suffer. From looking at the crumb, this dough might be an overnight ferment, but I highly doubt there's a preferment. No more than overnight, though, and possibly even same day (the crumb is really pretty white). No oil pizza crusts can be very deceptive in the way that they can sometimes take on a shiny GB appearance and look oily, and sometimes the oil from the cheese will travel to the rim and create the oily appearance, so it can be especially difficult to predict the oil content of a baked dough. This being said, everything about this crust seems like there's either oil in it or plenty of oil on it. I'd even go one step further and propose the theory that oil is what might be setting this pizza apart from other NH pizzas. Slightly higher oil will give you crunchy GB at fast bake times and, possibly, contribute to microblisters. Considering that this pizza goes back to the 30s, it might not be adhering to the oil-less NH tradition. Maybe. Like I said, oil in dough is, by far, really hard to detect. If it is high-ish oil (4%?) then it's most likely bromated bleached All Trumps or other bromated 14% flour. I don't think using a 13% flour would be that drastically different and it would help with second day toughness. Reverse engineering aside, as much as I rail against GB, this is really only on the crispier side of the spectrum of what I classify as the perfect, award winning pizza. I lean more towards puffy chewy rather than crispy, so I don't have the perfect storm of a recipe that produces great oven spring AND crispiness (and least, not yet), but this is, imo, within the 4-5 minute bake range that I feel makes the best pizza. More importantly, though, this pretty much epitomizes what a commercial pizzeria should be striving for. A little char, but no one's going to call it 'burnt,' a faster bake time to give it more character, properly bubbled low moisture mozz. 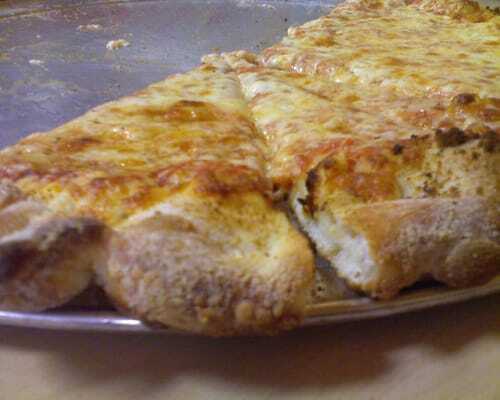 It's a little bit prettier and more mouthwatering, but it's not a world apart from typically mediocre NY style slices. It's basically NY with some intelligent tweaks and a little extra care, not the kind of re-invented niche wheel that you find with blackened NH pies or NY coal. In other words, you don't win the game by changing it, you just play it a little better. And it's something that anyone can do. You just have two forces to fight- apathy and novelty. Apathy will prevent a mediocre pizzeria from striving for better because mediocre pizza can still make plenty of money. Novelty will have a NY style pizzeria move towards a NH, NY coal or Neapolitan direction because they think that's where the fame is. Zuppardi's is the perfect example of a wildly successful and famous pizzeria that really isn't all that novel, when looking at it from a perspective of style. You're only really talking about a handful of informed choices that make the difference between earth shattering and mediocre. With a little furthering of knowledge, thousands of pizzerias could be producing pizza of this caliber. What a great post Scott, I really enjoyed reading it and got alot insight out of it. I have noticed the micro blisters on my bread when I do a cold retard for the final proof, an go straight to bake from the fridge. That's an excellent point regarding microblisters occuring in doughs that are baked chilled or slightly chilled. I've been meaning to give this a shot myself, but I've been having a tendency to need a bit more volume post refrigeration so I've needed to let the dough hit room temp. At some point, though, I'll definitely test this. Interesting stuff guys. Help me out please, what is "GB"? I gotta go work the line now, but before I go I gotta just comment of one sentance you posted....that GB DOESN'T HAVE TO BE A LONG BAKE....!!!! Marc, no pictures for us? Scott, thanks for the additional links and video. I would agree that GBD (golden brown delicious) doesn't necessarily mean long bake times. I once made a 57% hydrated Neopolitan dough that baked less than 2min and was crispy on the bottom and rim. The slice stood straight out like the one in the video. A glimpse of their dough in the video tells me it's a fairly low to mod hydrated dough. Definitely not high, like Bianco's or Varasanos dough. More like Grimaldi's dough, maybe a bit more wet though. That crumb is not open, signifying a well mixed dough. It's fairly thin in the center, but the rim is intentionally left thicker. Moderate oven spring. Not great and not poor either. Like Scott said, good chance of oil in the dough, especially IF the crust is fairly tender, to offset the extended mixing times. I would guess a 5-6min bake, not more though since their rims are not as dark as your typical NH style rim. It may not be so easy to replicate though Scott. It maybe easy in theory, but getting it exactly would probably require the same ingredients and tools, and even then there can be other unsolved mysteries. Getting it close however, shouldn't be too difficult though. Microblisters, I've always felt it was the extent of fermentation and heat. I see more of it in older doughs especially on the edge of the rim bordering and on the underside. And I also see it more often in stronger flour doughs as well. For some odd reason, the look of their crust kinda reminds me of a pizza hut pan pizza I once made, without the pan and the fried bottom of course. I bet if you tweaked that recipe, you'd come close. I loved how the guy on the serious eats video stated that the "bread part" is definately better at zuppardis'....guys, I know everyones tastes are different, but that pies crust IS what I am looking for. Maybe its time for a part time job. Chau...what would you consider a lower hydrated dough. We use 63....high, low, medium?? Any guesses on Zuppardi's. Im gonna reread this thread 3 or 4 times. Thanks a ton to you guys. Chau, as you know, a while back I dropped from 14% protein flour to 12.5% and that didn't seem to effect my microblisters. I do appear to be getting them always on my undercrust and rarely on the upper portion of the rim. I've also gone from 3 day ferments, with the occasional 4 to a consistent 2 day ferment and that hasn't impacted my microblisters either, at least not that I recall. I have to admit that I wasn't as microblister aware back then as I am now. Nick, I like your theory regarding condensation and microblisters. Hydration is relative- both to the brand/absorption value of the flour and the quantity of oil you're using. Off the top of my head, I'd say, if you're going with bromated All Trumps, then I'd try 61% hydration with 3% (maybe 4%) oil. For a 13% protein flour, then I'd go with 58%. I would try the AT first, though. We're kind of shooting in the dark here. It could be, imo, one of two types of flour (14% or 13), a relatively small range of hydration and maybe oil, maybe not oil- if we go with, say, two values for each hydration range, that's 6 'switches' and a total of 36 possible permutations. I can probably lean a bit towards one or two of the options and trim the number of experiments, but it's still a huge task. Any chance, the next time you go, could you bring a camera and/or do a little dumpster diving? An empty bag of flour sitting in the trash would make our lives so much easier. Temperature is relative as well. Most oven hearths vary, both in composition, and in thickness. I would say, the first time, shoot for a 5 minute bake. For a typical gas deck oven, I'd start off as high as it will go. If it's 650, then go with 650. Scott, when you switched to BF, did you change your mixing/kneading times or did you keep the 2-3min max kneading time? Yes, I agree that length of fermentation won't necessarily and reliably produce blisters either, as I have gone upto 5 and 6 day cold ferments without seeing any. As I said before (perhaps in another thread), my feeling is that it is the degree of gluten development, enhanced by flour strength but not necessarily dependant on it, the extent of fermentation, and high heat are the main factors to blistering. We know high heat helps as we often see blistering on the underside where it comes into contact with the stone. Another example of heat causing blistering is when I bake bread. I usually cover the bread with a metal bowl for the first 20m of the bake with the oven at 500. If the bowl isn't perfectly centered around the loaf and I have it closer to one side, I will see more blistering on that side since the metal conducts heat so well. I have also noted the blistering on my bread more so with higher gluten flours despite using the same folding techniques, thus my statement about flour strength. But it's all relative. For example, if you use a high hydration high gluten flour with a minimal knead and a short fermentation time, you will likely see less blistering compared to a BF dough, with a relatively lower hydration, that is well developed (well mixed/kneaded) and well fermented. So the protein strength of the flour is only one factor and it is dependant on other variables as well. Member Glutenboy makes the absolute finest looking blistered pies consistently and I would love to hear his ideas on the cause of that. I do recall reading that he uses a fairly well kneaded HG dough and that he paints his rims with oil prior to a bake. Zuppardi's is most likely not painting their rims with oil, but if their dough contains some oil, it could likely have a very similar effect. Nick, it's impossible for me to say that 63% is low, mod, or high hydration. Like Scott said, it is relative. Relative to the strength of the flour, the age of the flour, environmental factors such as humidity, brand of flour/absorptive values, amount of oil, length of fermentation, temp of fermentation, etc. I'm sure there are other factors as well that I may not be even aware of. I think the numbers Scott have provided to you are a good starting point and we can tweak from there. You and Scott live in the same geographical location, so your flours and absorptive rates should be very similar. My doughs tend to require about 3-4% higher in hydration compared to your environment but that is just a guess on my part. Good luck to you on your quest for your ideal crust. Nick, I made a couple of GBD pies tonight for you. These were 3 hour emergency pies from start to finish. I wanted to try out a few ideas and tweaked that PH recipe above. The pies weren't bad at all but tasted more like American style pies than NY style. They were a bit too tender. Go figure right? Anyways, I also wanted to try and get some blisters going with this Emergency dough, but no luck. I'm going to blame it on all the dough softening agents, 2% oil, old CY, dry milk, and perhaps a warm proof. Next time, I'll skip on the dry milk, and use IDY instead of old CY. I will say that the high % of CY did give the dough and crust this nice yeasty smell and flavor. It was quite interesting. Anyways, here are some pics. As far as it being american tasting, I really think its the emergency dough and milk. But I tell you the crust at zuppardi's, while it had character was a soft crust.....I mean it was crisp, tasty, brown with some char, but it had a tender crumb...the dough the next day was EXTREMELY soft, softer than ours or any other I had. THAT was my biggest dissappointment. Hot , it was un B effin lievable. I tell you your Hybrid NY pies look amazingly like Toby's Public house in brooklyn. He does a ny style pie in a wood oven, all 12 inches. I'm pretty much in the same realm, although I'm a bit less paranoid about overkneading because bread flour has much less of a tendency to produce a leathery crumb when overkneaded. At least, not AT leathery. I resonate with your microblister theories. No offense to the microblisternauts that have come before us, but I think we're making headway here. As I move forward, I'm going to be much more aware of microblisters and test these theories further. One interesting thing that just occurred to me is that my dough, in the container, has condensation on the top and oil on the bottom, where it makes contact. I've only just started becoming aware of container position in relation to final skin position, but I'm looking forward to seeing if I get more microblisters with the condensed side touching the stone or the oil side. I also can't help think about top and bottom container position without the context of coating- that if I evened the playing field by coating the top with oil prior to forming, would the top give me more blisters than the bottom? In terms of surface, the smooth top and cratered bottom are very different beasts- so it only makes sense that one would microblister more than the other. when we used to put our dough in container...you know those pizza dough containers.....a lot LESS condensation on the dough. We NOW do it the old New Haven way...on oiled sheetpans, with oil squeeze bottled on top of each ball and then TUCKED UNDER (the dough balls, NOT the sheetpan) with plastic wrap. MORE condensation and I have to say that was ONE move that improved our dough. I thought the old timers who told me that the boxes effected the dough were just spinning yarn, but they were right. Also, the more the dough is allowed to rise outside the walkin, while they are waiting to be made into skins, the more condensation occurs...I think its the coldness of the dough reacting to the warmth of the pizza ovens and room. Even when only the center of the dough is still cold, it still attracts water. That is one reason why, unlike some of what I read, I like my dough balls to be really really risen, not blown, but close. It make the pies harder to make round (i could care less) and the help hates it, but the pies have WAAAAAAAY more character, crunch, chew, blisters......just some observations on the commercial side.